Property owners have a duty to keep their property safe from hazards. If you or a loved one has been injured because they slipped and fell at a grocery store, mall or in a parking spot, the establishment may be liable for your injuries. I fight for my clients and aggressively pursue the compensation they deserve. I have extensive litigation experience and strong negotiation skills. If you have been injured, protect yourself and your rights. 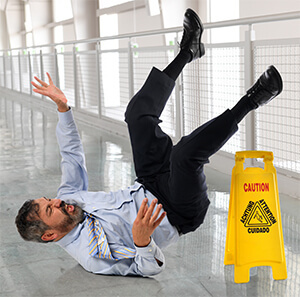 Contact an experienced Oakland slip-and-fall injury attorney at Kleczek Law Office. Contact our law firm to schedule a free initial consultation. Most people do not realize that if they fall in a retail store, the store is not automatically responsible for the medical bills they incurred as a result of their slip-and-fall. The retail store knows this, and requests you fill out an accident report. This information helps the retail store build their defense. The only way to hold a store responsible for injuries after falling on their property is to prove that they had actual or constructive knowledge of a dangerous condition. There are several ways of proving a store or property owner knew or should have known of the hazardous condition that caused your fall. Hiring a lawyer experienced in handling slip-and-fall claims is essential to maximizing your recovery. Slip-and-fall accidents are the most common type of premises liability case, and can cause serious injuries, including spinal cord injuries, brain injuries and sometimes death. If you have been injured in a slip-and-fall accident, contact my California office for a free initial consultation with a lawyer, not a paralegal.